A. davisii Chamb. & Matthews in Notes R.B.G. Edinb. 29: 308 (1969). Scapose perennial with woody caudex and procumbent or ascending stems. 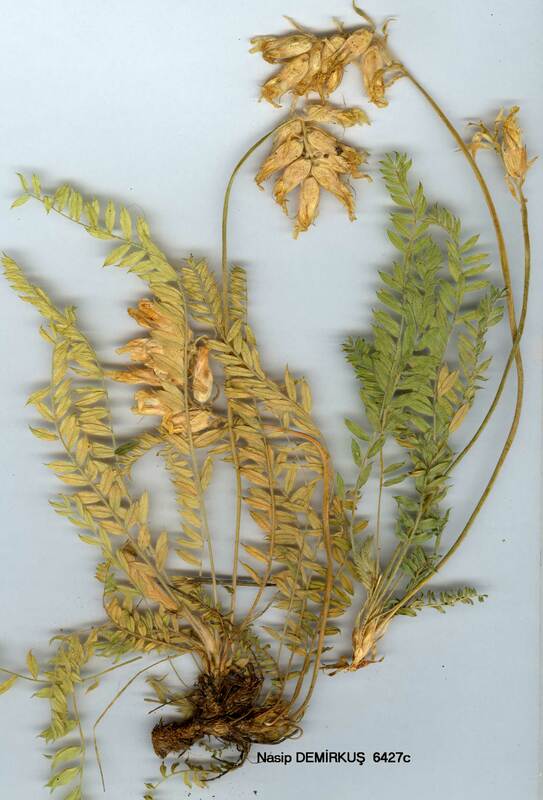 Leaves 10-20 cm, imparipinnate; leaflets 8-14 mm, elliptic, acute, mucronate, ±spreading long simple-pilose, 15-18-paired; stipules 12-15 mm, lanceolate, white-ciliate, jointed at the base. Peduncles spreading-hairy, equalling or exceeding leaves. Flowers fragrant, in dense ovoid 8-18-fiowered racemes. Bracts 10-15 mm, lanceolate, white-hairy. Bracteoles 4-8 mm, linear. Calyx 14-16 mm, tubular-campanulate, becoming slightly inflated, sparsely white simple-pilose; teeth 7-8 mm, triangular-linear. Corolla cream; standard 22-26 mm, glabrous. Legumes unknown. Fl. 5-6. Mountain pasture, scrub, 1900-3200 m.
Type: [Turkey] B9 Van: N. side of Erek Dağ, above Değirmenköy, 3200 m, rocky igneous slopes and meadows, 6 vi 1966, Davis 44465 (holo. E!). S.E. Anatolia. B9 Bitlis: Kisvak Da., 9 km NE of Tatvan, 1900 m, Cheese & Watson 1299! Endemic; Ir.-Tur. element. A very distinct and beautiful species. 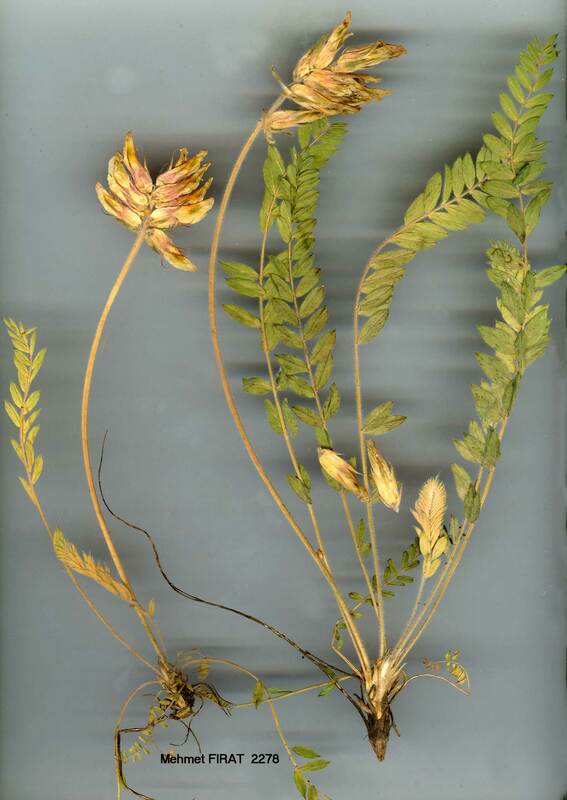 We have not placed it in a section because it does not fit easily into an existing one, but we do not wish to describe a new section without studying all the Astragalus of the Near East and Central Asia. The sections which it approaches most closely are Hymenostegis (from which it differs in its imparipinnate leaves and bracteolate flowers), Megalocystis (from which it differs in its imparipinnate leaves), Hali-cacabus (differing in its calyx never becoming globose-inflated), and Rhabdotus (differing in its bracteolate flowers). Fruiting material is needed.